Charnley River Station. What a hidden gem! We have never before ventured off the Gibb River Road and travelled the 47kms North that it takes to reach this delightful station stay. Previously known as Beverley Springs, the station has recently changed hands and the facilities are currently going through a bit of a re-vamp. The camping area consists of a large expanse of green lawn along the edges of a creek with numerous trees providing good areas of shade. On arrival, we were greeted enthusiastically by one of the managers who invited us to pick a spot. Later, she came over, took the camping fees and gave us detailed directions to the numerous sites and walks on offer. Many of the attractions are some distance out, needing a rounding trip drive of nearly 100kms to visit all the gorges. Not only does this require factoring in to fuel calculations when planning a trip across the Gibb, but it also presents a potential problem for the station managers in keeping track of visitors whereabouts. To assist with this, a “log in – log out” system is kept for those venturing off on day trips. If someone does not return, at least they have some idea of where to look. With camp set up and lunch settled, we headed out to a nearby waterhole called Donkey Springs, across 8kms of reasonable station tracks. 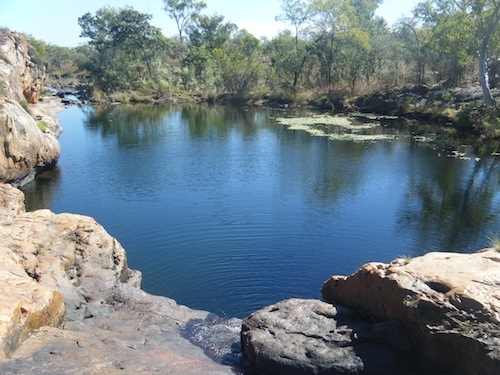 Donkey Springs is a wonderful series of pools and small waterfalls, complete with water lilies and even a bit of rock art. We hiked for a bit, admiring the lovely setting, before taking refreshing dip in the third pool. We had the whole place to ourselves. We headed back to camp for refreshment before taking a 1.5km walk to the nearby Paradise Pool and Paradise Falls. While these were both pretty spots, neither ranked as a “paradise”, with the water flowing having slowed to a mere trickle. There was enough of a clean pool to entice us in for a quick dip but we didn’t stay long, getting back to camp in time to settle in. Our neighbours, two women (Diana and Onnie), were having a spot of bother with their solar charging system so we played around with that but failed to make much headway. We did spend some time admiring their wonderful off-road caravan called an Adventure Trek. This is the best of its kind I have seen so it might be time to lock away the credit card until we calm down. The next day we explored further, driving approximately 35km North to Grevillia Gorge. 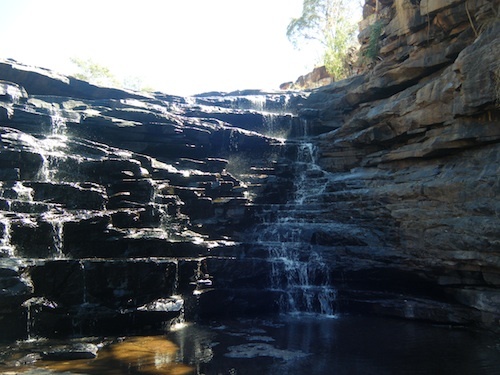 This is a very beautiful gorge, possibly the nicest in the Kimberley. It reminds me of Bell Gorge, with its succession of tiered gorges and big waterfalls but whereas Bell Gorge has little vegetation in the gorges themselves, Grevillia has some lovely garden like settings around the pools. We were totally enchanted with the place. Access to the main gorge is interesting, requiring a descent on a metal ladder. Christine nearly freaked out and provided some measure of entertainment for other visitors.We met Diana and Onnie there, and drove back with them to share lunch at the Plain Creek crossing. They pushed on South to Dilly Gorge, but we were worn out and elected to go back to camp for a rare afternoon nap. That night we joined Diana, Onnie and another set of neighbours for fireside drinks. We were entertained with some excellent guitar playing from both Glen and Onnie. A beautiful night. 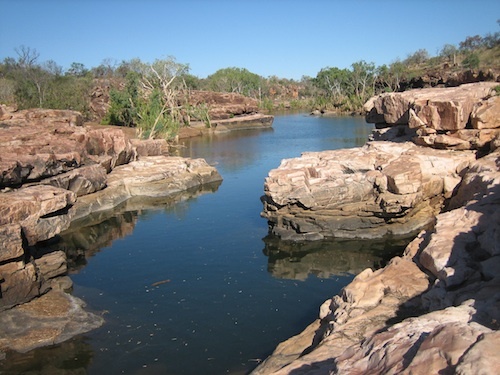 From Charnley, we drove on to Windjana Gorge to set up camp for a night time performance of Jandamarra. This exciting play tells the story of Pigeon (Jandamarra) who lead an 8 year war against the white settlers in the Bunuba lands during the late 19th Century. 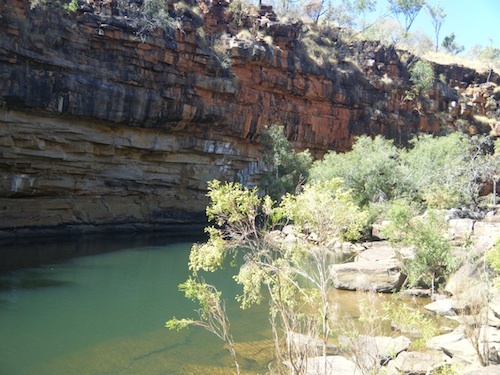 Jandamarra lived in the “limestone” country of which Windjana is a part. 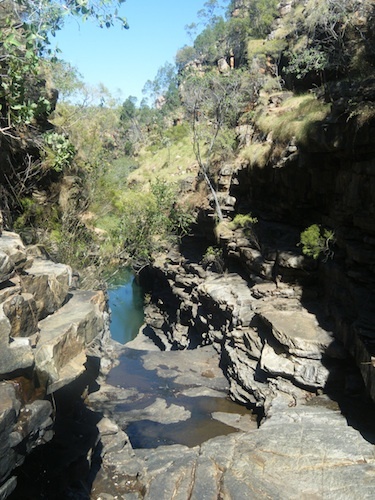 Indeed, Windjana Gorge was the scene of one of the biggest battles of the war itself. With the lights playing on the walls of the ancient Devonian Reef, the play was quite a spiritual experience. The acting was excellent and the energy of the cast was quite amazing. I think that actually being in the original story’s setting made quite a difference. The only down-side was the temperature. It got quite cold, even though we had warm clothes and blankets. The next day was a big one; we were up early, packed camp and drove to Broome. There we raced around town picking up some materials needed for some work at One Arm Point then did some personal shopping. This was followed by the 200km drive to One Arm Point. The 100km of unsealed road had deteriorated badly over the school holidays and was heavily corrugated in places. It was one of those cases where the road always looked flatter on the other side. We crawled into the Thorsby house at One Arm Point just before sundown, absolutely exhausted but ready to prepare ourselves for a week’s work at the school. 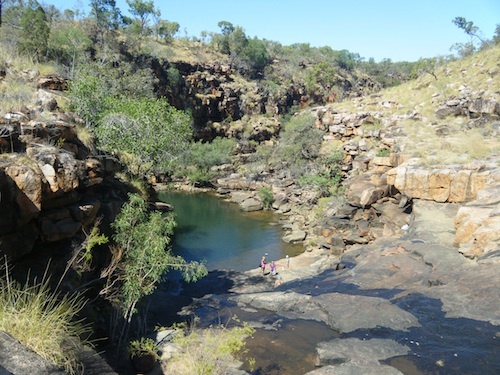 After visiting Windjamma Gorge last year with you we can imagine what a wonderful experience seeing a live performance of the story of Jandamarra would have been. You are very fortunate to have been there for the experience.